Pre-School | Kindertots Children Centre Inc. This program is for children aged 4 years old. The maximum group size is 20 children to 2 Early Childhood Educators. In this program, while following the New Brunswick Curriculum Framework, children continue to learn letter and number recognition, printing their names along with name recognition, shapes, colors and concepts. Children enrolled in this program focus on School Readiness Skills and Self Help Skills such as dressing themselves for outdoor play. Fine and Gross Motor are also focused on as part of this program and all is learning through Project work based on the children’s interests. Children in this group also get involved in the community, using community resources as a big part of their program. Our new Four year old Pre-School Program is being offered on Tuesdays and Thursdays at St. Michael’s Parish Centre from 9am to 12pm. 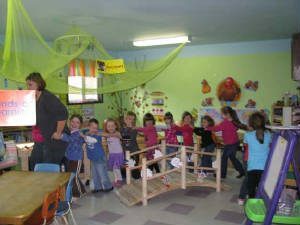 Our Program is designed around an Educational Play-Based Model which is the New Brunswick Curriculum Framework and focus is put on School Readiness Skills, Self Help Skills as well as Gross and Fine Motor Skills. Activities and Projects are based on each child’s interest and ideas. Educators offer learning experiences by expanding on children’s ideas and they work together to research and explore topics of interest through an Educational Program.